A historic blizzard will pummel the I-95 corridor Monday night and Tuesday. Before this storm really cranks up, it will bring a few inches of snow to the Finger Lakes. Click image to enlarge. Light snow will fall across the Finger Lakes today as low pressure over the Ohio Valley drifts northward and begins to transfer its energy to the Blizzard of 2015. Rare Blizzard Warnings are widespread from coastal New Jersey to Maine, including New York City, Long Island, all of Connecticut and Rhode Island and Boston. 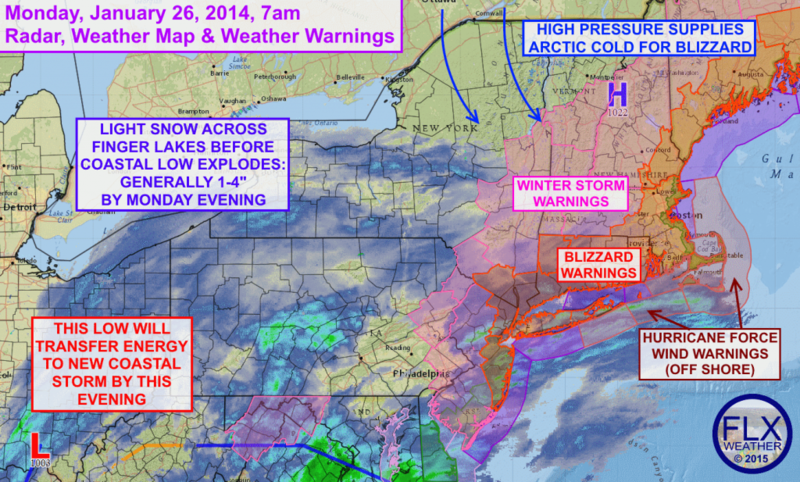 Blizzard warnings are only issued when a life threatening combination of snow, wind and cold are expected. The last blizzard warnings we had in our area was during the epic lake effect snow in Buffalo in November, which tragically did prove deadly. Low pressure over southern Ohio this morning will gradually transfer its energy to a new low off the Mid Atlantic coast this evening. High pressure to the north will supply plenty of cold, arctic air, setting up an extreme temperature boundary between the arctic air and the mild air over the Atlantic Ocean and Gulf Stream current. Low pressure will explode over this boundary, quickly approaching the strength of a minimal hurricane. Some areas of New England may exceed 25-30″ of snow with this storm, while just off shore, hurricane force winds are likely. In addition to the wind, cold and snow, massive beach erosion is likely. Before all of this unfolds though, snow out ahead of the Ohio low will spread north into the Finger Lakes for much of Monday. This snow should primarily be light, but will persist into the afternoon and early evening hours. The highest accumulations will likely be over the southern portions of the region, but generally speaking, 1-4″ of new snow is expected. A little snow is possible again Tuesday evening over the far eastern reaches of the Finger Lakes as the blizzard stalls and maybe even tracks west slightly before zipping off to the northeast. If the snow does reach back into our area, it probably won’t make it west of I-81 or Cayuga Lake with no more than an inch falling. More bitter cold air will work in for the middle of the week behind the blizzard.